In the old South Africa, with its inhabitants divided into two worlds by an ideology-driven white minority, H.W. van der Merwe was one of the first white Afrikaners who took the risk of crossing the boundary which in the culture of his own group was upheld as divinely ordained. On account of the radical change in his socio-political convictions, and his resulting research and teaching, he was appointed as director of an institution aiming at improving intergroup relations through applied research and educational programmes. He also took the lead in founding an association for conflict intervention. His remarkable contribution to the anti-apartheid struggle and the eventual resolving of the white-black conflict was not only a structural one, however, but also an interrelated attitudinal one. His outreaching understanding and his courageous quest for justice and peace enabled him to bring adversaries together, and also to confront the unflinching guardians of apartheid. It behoves us, therefore, to celebrate his example and to emulate it in our current context. We may be grateful for the degree to which transition has already taken shape in the new South Africa, but so much remains to be done to minimise socio-cultural distances between sectors of fellow-South Africans. H.W.’s legacy may indeed help us to respect ‘them’ and ‘us’ where appropriate, but also to promote an ‘all of us’ orientation as far as fellow-humanly possible. The theme of this special issue calls us to reflect on the then and the now of resolving South Africa’s anti-apartheid conflict. And the sub-theme calls us to do this in honour of an ahead-of-the-time leader of those days, whose legacy may inspire us to be ahead of our time – not only for our own sake, but especially for the benefit of generations to come. Obviously, however, our contemporary and future readers will need contextualising in order to understand the differences – and the similarities – between the then and the now. Fifty years ago, a racistly divided South Africa desperately needed a transition into, or at least towards, an ethno-culturally coexisting South Africa. On each side of the divide, however, most of the leaders and followers were narrow-mindedly engrossed in their group-centred narratives, ideologies and goals. Fortunately, here and there, on both sides, initiators of open-minded thinking, relating and interacting did emerge. The unquestioned assumption – apparently with good intentions – was that everything in the Christian Bible, which included the Jewish Old Testament, was literally God’s Word. A few passages from the Old Testament, which actually were about religious exclusion,2 were interpreted in terms of social exclusion, and so apart-ness between whites and blacks was religiously (!) upheld as divinely ordained. The whites regarded themselves not as settlers, but as God’s ‘chosen people’ who had been sent to evangelise the people of Africa. They regarded their religion, their culture and themselves as undoubtedly superior, and stayed aloof from any socialising or intermarrying with the inhabitants of the country they had colonised. As a youngster being raised in such a setting, I did not immediately realise the injustice apartheid was inflicting on our compatriots. After all, in home, school and church we were taught to be friendly and respectful towards everyone, and to live in good relationships as far as possible – that is, up to the non-negotiable (divine!) dividing line. That, very briefly,3 was the context of the group into which H.W.4 van der Merwe and I happened to have been born (H.W. two years before me). At first, both of us were submissive and loyal observers of the culture of our group, but then, in our late twenties, we had, quite independently, eye-opening experiences. He described his ‘moment of truth’ as arriving at ‘the profound realisation that a person was not defined by colour but by other shared human qualities’ (Van der Merwe 2000:31). That breakthrough launched him on a meaningful and influential journey in which he courageously ventured to cross the barriers between the following groups: ‘Boer and Brit’,5 then ‘Afrikaner and coloured’ and finally ‘White and black’ (Van der Merwe 2000:56, 58, 63). What deserves to be remembered and emulated, however, is not only that he defied intergroup barriers, but how he did it – in a non-ostentatious but persuasive way. His effortless, spontaneous way of living and working clearly showed that his attitudinal transformation was genuine and irreversible. He did not try to cross the then firmly established intergroup barriers; his change of mind automatically took him into the dimension of interhuman coexistence. That, however, was an out of bounds move in the South Africa that was regulated and policed in terms of apartheid policies and practices. He also crossed the ecclesiastic barrier around the Dutch Reformed Church in which he had grown up, but in which he had to object ‘to the racist policies and attitudes, to formality, to the emphasis on dogma and creed…’ (Van der Merwe 2000:48). In Quakerism6 he found ‘a profound new dimension’ to his life and a satisfying ‘spiritual home’ (Van der Merwe 2000:50). By this move he became liberated from the domain in which religion is mainly manifested in externalities. He identified himself with a genuinely inner spirituality which (also automatically) transformed his faith relationship and his fellow human relationships. Religiously, he was therefore frowned upon, and socio-politically he was confronted with opposition and ostracism. But he was undeterred and persisted in radiating the powerful influence of an approach in which attitudinal change and structural change were integrated. He did not only experience a change of mind. He did not only run a Centre. His insight, attitude and conviction motivated him to promote the changing of an unjustly structured system. He realised that ‘[j]ustice is achieved not by enforcing law and order, but by creating a just society whose members are assured of the opportunity to realise their human potential’, and that ‘the pursuit of justice and peace implies fundamental social change’ (Van der Merwe 1989b:1). His system-transforming work was therefore done in the spirit of intergroup relations and with a commitment to profound spirituality. This attitudinal-structural interrelatedness is intended to be the core message communicated by this paper. It is a message that was relevant fifty years ago, is relevant today and will apparently be relevant for the foreseeable future and beyond. After ten years of research and/or teaching in the fields of sociology, social welfare and industrial relations, H.W. was appointed as Director of the Abe Bailey Institute of Inter-Racial Studies at the University of Cape Town (Centre for Intergroup Studies 1987:2). His task was to ‘do applied research and conduct educational programmes with the purpose of improving relations among different population groups’ (Van der Merwe 2000:40). Interestingly enough (and almost astonishingly), however, the founder and sponsor of the Institute apparently only had in mind ‘the Afrikaner and English “races”‘ (Van der Merwe 2000:41). Sixty years after the Anglo-Boer war (1899–1902), it was indeed still necessary to promote rapprochement and reconciliation between the two language groups, but both of them belonged to the same ‘racial’ group – which formed a minority in the population of South Africa. They did have socio-political power as if they were a majority, but it was precisely the way in which both of them (mis)used such power that bedevilled the major issue of black-white relations in the country. As someone who was experiencing the three successive barrier breakthroughs mentioned above, H.W. was very much aware of the short-sightedness of only trying to bring English and Afrikaans whites closer together. He tactfully took his time, however, and gradually prepared the way. Then, when five years later he proposed a name and policy change, the trustees and board of governors unanimously accepted his very relevant recommendation. The name ‘Centre for Intergroup Studies’ was then adopted ‘to reflect this inclusiveness’ of South Africans of all skin colours (Van der Merwe 2000:41). It was my privilege to experience personally H.W.’s non-rushing thoroughness in another but related context, and to internalise the lesson for the rest of my life. 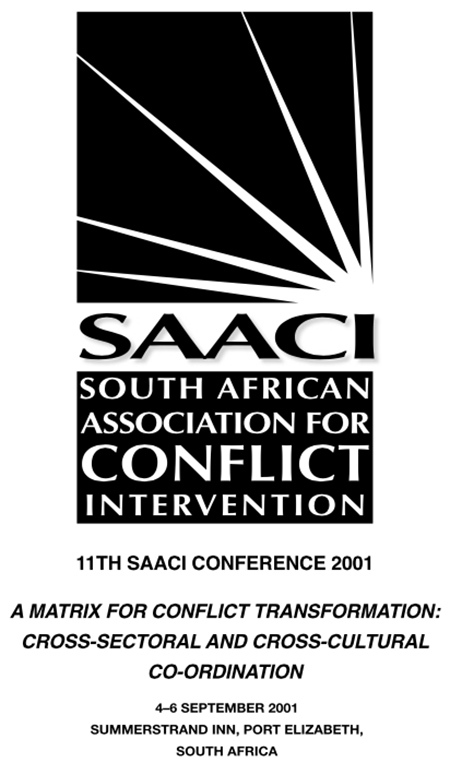 That was after the South African Association for Conflict Intervention (SAACI) had been established (1988)7 and when a first workshop-type of conference was being planned (1990). By then, two National Conferences on Negotiation and Mediation in Community and Political Conflict had already been held (Durban 1986, 1988), ‘initiated and organized by the Centre for Intergroup Studies (CIS)’ (National Workshop Committee 1990:2; Van der Merwe 2000:104). In spite of this background, however, no less than 13 planning meetings were held between February and November 1990. After the first few of those meetings, I (as the then President of SAACI) began feeling that we should start with the actual planning, but I fortunately tolerated H.W.’s ‘broadening of the base’ approach. That included the following: ‘Exploratory letters of information and requests for feedback were circulated to all known people in the field of negotiation and mediation in community and political conflict, excluding political parties’ (National Workshop Committee 1990:3). The extended process was worthwhile indeed. No less than 89 participants, representing 45 organisations, attended the workshop (National Workshop Committee 1990:5). The Workshop itself started in an atmosphere of inclusiveness and receptiveness. After the welcoming words, the first plenary session was on ‘Identification of themes’, and this was excellently facilitated by Sandra Fowkes of the Environmental Evaluation Unit of the University of Cape Town. After an apt reference to Alice in Wonderland and the Cheshire cat,8 she used the method of facilitated visual gathering. Participants wrote their hopes and expectations on cards, stating one idea briefly on each card, and the cards were then sorted and grouped on flipcharts. In that way, the expectations of the participants provided the topics for the breakaway groups, which formed the core of the entire workshop. And at the end, the participants rated the workshop as ‘very interesting and informative, very educative, very enlightening, worthwhile and stimulating, helpful and exciting, satisfying and successful’ (National Workshop Committee 1990:13). For the possible benefit of other clock- and calendar-driven fellow-whites, I wish to share another experience which has endorsed what I learnt from H.W. about spending ample time to listen, question and explore. This happened when I was member of the Student Disciplinary Committee at the University of the Western Cape. It was not a pleasant committee to be serving on, but I appreciated the trust of the Students’ Representative Council who had nominated me to be there. Between all the teaching schedules of the members of this Disciplinary Committee, the secretary usually had a difficult job to find a few hours for a meeting that would suit most of us. Each meeting normally had several cases to be heard in the available time, and I (as well as other members?) tended to be in a hurry to work through the agenda. I therefore felt irritated about ‘the waste of time’ when a black colleague would begin asking an accused student various questions about his/her life situation and background – home, family, parents, siblings, experience, interests, and so forth. But I discovered the great value that a few minutes on an empathetic wavelength could have for both the student and for us as judges. Not at all that such contextual information would lead to ameliorating the eventual verdict, but it could at least communicate the interest and understanding underpinning the hearing and its outcome. So, although I still happen to have an inborn Northern stopwatch ticking in me, I gratefully adopt a Southern relaxedness that can overrule the watch for the sake of human relations. Before moving to the following section (on approaches), it is important to take note of the semantics written into the names of the two structures briefly discussed in this section. The first structure initially had ‘Inter-Racial Studies’ in its name and later ‘Intergroup Studies’. The word ‘Studies’ meant research and training in order to improve relations. The second structure had ‘Conflict Intervention’ in its name, which communicated the meaning that conflict was a reality and that intervention was necessary. Each of the two names made a statement, and together they conveyed the optimistic message that relations can be improved and that conflicts can be resolved. Both these prospects were urgently relevant fifty years ago, and are still urgently relevant today. It is very likely, therefore, that readers of this special issue will find then-relevance and now-relevance on many pages. During the fifty years, however, there were further changes. In 1994, the Centre for Intergroup Studies became the Centre for Conflict Resolution (CCR), and after 2001 the SA Association for Conflict Intervention disappeared from the scene. The name that lived on, and still remains in place, is ‘Conflict Resolution’.9 Although ‘Studies’ no longer appeared in the name, study and research were duly sustained, however. Something more deserves to be said about 2001. That was the year in which H.W.’s meaningful life came to an end (5 March), and in which SAACI had a very successful 11th conference (4–6 September). The theme of the conference was: A matrix for conflict transformation: Cross-sectoral and cross-cultural co-ordination. Sixteen papers, some by international speakers, and 15 workshops were presented to about 150 participants. Tribute was paid to H.W., and the participants could watch a video of his last public performance: the James Backhouse lecture he presented in Australia in January 2001 on the theme of ‘Reconciling opposites: Reflections on peacemaking in South Africa’ (Van der Merwe 2001). But, while sufficient funding could be raised for the 2001 conference, the next conference that was planned for 2003 never took place due to a lack of funding. Unfortunately there was no opportunity to conclude SAACI’s 12 years with proper closure and with a fitting tribute to its members (including its visionary founder) and its work in a crucial period of South Africa’s remarkable but challenging transition. As a reminder, however, we may insert a copy of the cover of that last conference programme in this special issue. If a community has generated the energy to confront authority and demand legitimate change it would be wasteful to defuse the situation before a strong case had been made by the protesting party. It would be counter-productive for the mediator to enter this sort of situation too soon, or at the request of the establishment only, or even if asked to come in by a few faint-hearted members of the community. Under such conditions partisan intervention on behalf of the weaker party is required together with, or even prior to, neutral intervention’ (Van der Merwe 1989a:3). He further argued ‘the case for informal facilitation of communication between adversaries while formal mediation may not be possible’ and made ‘a plea for the establishment of a national mediating service’ (Van der Merwe 1989a:1). We often read in the papers about prominent people and organisations ‘mediating’ in community and political conflict. Nearly all of these are examples of partisan intervention. While I encourage and praise such efforts and while there is ample evidence that they often contribute quite significantly towards better understanding and better relations, it is misleading to refer to them as mediation. If these efforts fail, as they sometimes do, the public may argue that we have tried mediation and it did not work (Van der Merwe 1989a:2; cf Van der Merwe 1989b:89). For our present purpose, it is relevant to take note of a characteristically Quaker approach to mediation as captured in the title Being in the middle by being at the edge (Williams and Williams 1994). This approach is oriented towards relationship building, trust building and bringing the sides together (Williams and Williams 1994: chapters 4, 5 and 6). It forms part of an overall approach in which there is a consistent ‘preference for peace and pacifism rather than war’ (Dandelion 2008:2, 118), but also a commitment to (spiritual) equality and (inter-human) justice. In the late 18th century, for instance, their propagation of justice included a provocative but influential ‘witness against the slave trade’ (Dandelion 2008:93). It was such a mediatory approach that was practised and promoted by H.W. – with a keen sense of the degree of pressurising that would be appropriate in each particular context. He had experienced how the upholders of apartheid were unconsciously blind to the injustice they were inflicting, and he therefore realised that in trying to bring the two South African sides together more than mild mediating would be required. In his address at the launch of SAACI, he mentioned the need ‘to assist and empower the weaker party’ and said: ‘I therefore accept the morality and sincerity of intervention, including partisan intervention’ (Van der Merwe 1989a:2). And when writing his biography and looking back, he wrote: ‘During three decades, my role as an academic and as a Quaker gradually shifted from activism to securing justice, leading towards my mediating role as bridge-builder and peacemaker’ (Van der Merwe 2000:55). In the polarised, emotionally charged atmosphere of community conflict, the task of the impartial mediator is made all the more difficult by the desire of injured parties for retribution. While all sides may pay lip-service to the need for peace and reconciliation, the overriding thirst is for justice, restitution, and the bringing of culprits to book. Especially in situations of violent conflict, the goals of peace and justice appear to be at loggerheads with each other, and the role of the conflict intervener is fraught with risks (Van der Merwe and Meyer 1992:5). Theory is always simpler than reality. Even when it seems terribly complex, it is still simplistic, as compared to [sic] the range of factors, operating as conditions, as means, or as ends in any concrete situation’ (Viner 1953:1, quoted in Gulliver 1979:265). Most of the mediation initiatives were unsuccessful, with one or more of the protagonists spurning negotiations, being unwilling or unable to reach a settlement in the course of mediation, or subsequently violating the terms of a peace agreement (Nathan 1999:1). … the key to effective mediation lies in understanding, managing and transforming the ‘psycho-political dynamics’ of conflict which make adversaries resistant to negotiations. Notwithstanding the varying causes and features of conflict, these dynamics can be described in general terms: the parties regard each other with deep mistrust and animosity; they believe that their differences are irreconcilable; they consider their own position to be non-negotiable; and they fear that a settlement will entail unacceptable compromises (1999:1). ‘Confidence-building mediation’ indicates a style of mediation that is oriented towards raising the parties’ confidence in each other, in negotiations and in the mediator. The emphasis is on facilitating dialogue and joint problem-solving rather than on pressurising the disputants to reach a settlement (1999:3). This paper (from which more deserves to be quoted, considered and applied) has played an important role in the work of CCR and has disseminated its crucial message at more than one seminar.13 It is structured around six strategic principles of mediation (1999:2–17), but does not negate ‘the necessity for mediators to be flexible, creative and responsive to changing circumstances’ (1999:2). It frankly discusses ‘the flawed logic of power-based mediation’ and then outlines ‘the logic of confidence-building mediation’, which ‘reflects the basic logic of mediation’ (1999:19–23). In the conclusion it recommends to international actors that they ‘should acquire greater proficiency in the art and science of mediation’ and become skilled in applying ‘techniques to facilitate communication, understanding and accommodation’ (1999:25). What makes this paper (Nathan 1999) very relevant for the purpose of this special issue is that it shows how, decades after the founding of conflict-resolving structures in South Africa, the attitudinal component remained pivotal in effective and sustainable conflict resolving. Insights, skills and dispositions revealed and propagated by H.W. and like-minded initiators of South Africa’s transition are still appropriate and indispensable. Moreover, if attitude-oriented mediation has to be recommended for the ending of civil wars, should it not be taken as seriously at the levels of community, domestic and interpersonal conflict? If, as stated on the first page of the above-mentioned paper (Nathan 1999:1), international, high-profile mediation time and again failed because of the unwillingness of belligerents to reach or uphold a peace agreement, it is on willingness that mediators should focus their attention. It should immediately be added, however, that no thought should be given to ways of inducing willingness. Willingness is after all, self-evidently, voluntary. Any form of real or perceived pressurising should be carefully avoided. Tactful advising might sometimes be considered, but empathetic imagining and creative thinking may usually be better options. What could, however, communicate the message with the greatest potential of convincing, is spontaneous exemplifying. In other words, the mediators should not try to show their own willingness to contribute to the process. It is when their body language shows that for them such willingness comes naturally that a genuine and inviting message is communicated. At the same time, H.W. willingly accepted the challenge to improve his English and use it in his career. Having been in a rural, Afrikaans-speaking school, he only had a working knowledge of English as a second language, and never really had to use it. Then, at a predominantly Afrikaans-speaking university there was also little if any need to speak English. He realised, however, that ‘[t]o reach out to the wider community and to the international academic world, I had to write in English’ (Van der Merwe 2000:33), and so he did. Conflict accommodation is both an art and a science. The art refers to the more spontaneous and natural inclination to intervene. The science refers to the skills, techniques and expertise acquired through study and experience. Goodwill is not enough; expertise is essential (Van der Merwe et al. 1989). After ACCORD’s ’20 years of contributing to peace’, and after the second half of the 20th century in which the science of dealing with conflict developed quite rapidly into a comprehensive body of theoretical knowledge and practical expertise, it may sometimes be necessary to invert the last sentence in the above quotation and emphasise: Expertise is not enough; goodwill is essential (cf Malan 1999:2). H.W. was a living example of interrelated art and science. As we knew him, and as confirmed by his writings, he was grateful for what he learnt when he became an African and when he became a Quaker. In both cases, it was apparently not a matter of learning some ‘lessons’ or acquiring some ‘attitudes’, but one of inwardly experiencing a profound change – cultural and/or spiritual. It is for this reason that the heading of this section contains ‘attitude’ in the singular (cf Malan 1999:4), and that the contents of this section are not made up of sub-sections on various conflict-resolving attitudes. ‘Africans should make a conscious effort, both in and out of their parliaments, to nurture and deepen the culture of tolerance and pluralism in all social transactions’ (Prah 1996:18). ‘The politics of reconciliation suggests that in deeply divided societies, social healing should take precedence over elections’ (Assefa 1996:57). ‘African countries should look at their independence as a transitional phase on the way to more interdependence rather than as an end state’ (Assefa 1996:60). ‘Formal education to encourage individuals and groups to better understand one another and to avoid negative stereotypes is required … Cultural diversity must be respected’ (Ocaya-Lakidi 1993:15). For our present purpose, however, the main emphasis should fall on the single but momentous shift from exclusive I- or we-centredness to inclusive other-orientedness. It is when such a basic change of attitude has taken place that attitudes as the above-mentioned ones come spontaneously. An inwardly transformed individual or group does not need a duty-based effort to display advisable attitudes, but spontaneously thinks, speaks and acts in ways which radiate the underlying attitude-shift. Not at all does this mean anything in the direction of meek and mild pacifism. On the contrary, an orientation towards conflict resolution that satisfies all parties will always include firmness about the rectification of injustice.19 What could be learnt from H.W. and others with the same kind of attitude, however, is that such firmness can be applied with the subtle power of an inter-human understanding and a genuine commitment to problem solving.20 That, after all, was the background to and the atmosphere around H.W.’s bringing together of black consciousness leaders and white consciousness students,21 and of black freedom campaigner Nelson Mandela and white freedom campaigner Carel Boshoff (Centre for Conflict Resolution 1994:3). Forceful ‘conflict resolvers’ will tend to ridicule such an approach and rather practise some form of leverage22 – which may indeed lead to results that appear to be spectacular, but are not sustainable. If parties are to ‘own the settlement’ (Nathan 1999:10–13) and cooperatively implement it, it is not outward manipulation that is needed, but inward conviction. That is precisely the model H.W. has given us – as an example worth following and a legacy worth treasuring. In my experience with the South African establishment and the African National Congress (ANC) in exile, I have always maintained that I served as a facilitator assisting both parties to have meaningful communication and gain reliable information. I did not urge the parties to put the knowledge to good use or to make peace. It was up to them to decide how they would use these insights. This approach probably accounts for the positive responses I have had from both sides.23 The facilitator is less likely than the mediator to be seen as a meddler or a busybody, a preacher or a conciliator. He or she does not offer or attempt to bring the parties together, but, obviously, should the parties be ready to take that step, the facilitator may well be an appropriate person to assist (Van der Merwe 1989b:95). It is general knowledge that ‘[t]he intervention of a mediator turns the initial dyad of a dispute into a triadic interaction of some kind’ (Gulliver 1979:213), and it is general experience that the attitude of the mediator may influence the nature of the interaction between the parties themselves. If the parties are assisted ‘to have meaningful communication and gain reliable information’ (as stated in the above block quotation), they might experience the interrelated breakthroughs to understanding, mutual understanding and joint problem solving.24 And as soon as parties undergo such a mindshift, they find themselves in a new dimension of togetherness. They are no longer just sitting together under a tree or around a table where talks about their conflict are taking place; they suddenly sense an unseen energy drawing them together to tackle the cause(s) of their conflict and to work towards rectifying what had gone wrong and towards restoring their relationship. I have always argued that whites are not inherently better or more moral than blacks. Similarly I have warned that blacks are not inherently better or more moral than whites. A fundamental tenet of my life has been the Quaker belief that ‘there is something good in every person.’ But I am not blind to the presence of something evil in everyone. The fact that power corrupts speaks loudly from every country (Van der Merwe 2000:219). These insights did not deter him, but apparently only strengthened his motivation and dedication to Pursuing justice and peace in South Africa. It was that conviction [about something good, something of God in every person], even before he became a Quaker, as a teenager in fact, that drove him into the role of mediator and peace-broker between antagonistic groups. As a church and community worker and then also as an academic, he pursued with intrepid persistence – belied by his almost diffident manner – the improvement of mutual understanding between adversaries, plunging himself into conflicts of every kind. Always committed to a practical application of academic research, and to communication with as wide a public as possible, he has [written profusely] … The focus has been on the nature of group identities, their fears and aspirations, and on the principles governing the success or failure of communication, mediation, negotiation and efforts to reduce violence (Centre for Intergroup Studies 1989:19). There was, for instance, what he called his ‘moment of truth’, when it dawned upon him that the basic equality of fellow-humans cannot be outlawed by the sectarian ideology of one group. There was his embracing of a ‘spiritual home’ where there was no effort to observe religiosity, but where the homely spirit was one of inner spiritual experience and one of peaceful human coexistence. There was, in his student years, his internalising of what he called ‘more cosmopolitan views’: scientific objectivity, religious inclusivism and philosophical exploring (Van der Merwe 2000:33). And there was his realisation of the value of acquiring proficiency in another language as his own for the sake of communication in multilingual South Africa and elsewhere in the world. May all of us as South Africans keep moving further away from a tragic history of separateness and deeper into a promising future of coexistence and cooperation. This was my last sentence, but as I was putting finishing touches to this paper, the 95 year-long and very significant life of South Africa’s first president, Nelson Mandela, came to an end. Now, we can also and especially be enthused on the way forward by his overarching legacy of anti-apartheid and pro-togetherness. Assefa, Hizkias 1996. Peace and reconciliation as a paradigm: A philosophy of peace and its implications for conflict, governance and economic growth in Africa. In: Assefa and Wachira 1996, pp. 42–71. Assefa, Hizkias and George Wachira eds. 1996. Peacemaking and democratisation in Africa: Theoretical perspectives and church initiatives. Nairobi, East African Educational Publishers. Brümmer, Willemien 2013. Die wysgeer en die wonder van lewe (The philosopher and the miracle of life). In: Die Burger, 29 June 2013, By (Annexure), p. 3. Carroll, Lewis 1984. [Original publication date 1865.] Alice’s adventures in Wonderland. London, Victor Gollancz Ltd.
Centre for Conflict Resolution 1994. Profile: Hendrik Willem van der Merwe. In: Centre for Conflict Resolution Annual Report 1994. Cape Town, Centre for Conflict Resolution. Centre for Intergroup Studies 1987. Intergroup: A newsletter of Conflict and Peace Studies and activities in South Africa, No 1, July–Sept 1987. Centre for Intergroup Studies 1989. Centre for Intergroup Studies: 21st Anniversary Review. Cape Town, Centre for Intergroup Studies. Dandelion, Pink 2008. The Quakers: A very short introduction. Oxford, Oxford University Press. Giliomee, Hermann 2013. Apartheid kom nie van dié akademici (Apartheid did not come from those academics). Letter in Die Burger, 14 June 2013. Giliomee, Hermann and Bernard Mbenga 2007. New History of South Africa. Cape Town, Tafelberg. [Gounden, Vasu] 1991. Proposal for the establishment of a National Training Centre in Conflict Resolution Skills. Gulliver, P.H. 1979. Disputes and negotiations: A cross-cultural perspective. New York, Academic Press. Malan, Jannie 1999. Africa’s attitudinal, relational and traditional art of dealing with conflict. Paper (the second of two conference opening papers) presented at the All-Africa Conference on African Principles of Conflict Resolution and Reconciliation, held at the United Nations Conference Centre, Addis Ababa, 8–12 November 1999. Nathan, Laurie 1999. ‘When push comes to shove’: The failure of international mediation in African civil wars. Track Two, 8 (2), pp. 1–27. National Workshop Committee 1990. Report: The National Workshop on Negotiation and Mediation in Community and Political Conflict, 21–25 November 1990, St Peter’s Lodge, Rosettenville, Johannesburg. Ocaya-Lakidi, Dent 1993. Africa’s internal conflicts: The search for response. Report of a high-level consultation, 23–25 March 1992, Arusha, Tanzania. New York, International Peace Academy. Prah, Kwesi 1996. The crisis of neo-colonialism in Africa and the contemporary democratic challenge. In: Assefa and Wachira 1996, pp. 7–22. Van der Merwe, H.W. 1989a. Coping with conflict: The South African Association for Conflict Intervention (SAACI). Address given on the occasion of the public launching of SAACI on 5 April in Cape Town, 12 April in Port Elizabeth and 20 April in Durban. Van der Merwe, H.W. 2000. Peacemaking in South Africa: A life in conflict resolution. Cape Town, Tafelberg. Van der Merwe, H.W., J. Maree, A. Zaaiman, C. Philip and A.D. Muller 1989. Principles of communication between adversaries in South Africa. Rondebosch, Centre for Intergroup Studies. Van der Merwe, Hendrik W. 1989b. Pursuing justice and peace in South Africa. London and New York, Routledge. Van der Merwe, Hendrik W. 2001. Reconciling opposites: Reflections on peacemaking in South Africa. James Backhouse lecture, January 2001. Quakers Australia. Available from: <www.quakers.org.au/displaycommon.cfm?au=1&subarticlenbr=29> [Accessed 11 November 2013]. Van der Merwe, Hendrik W. and Gabi Meyer 1992. Unfinished business: The quest for a stable peace. In: Track Two, 1 (3), pp. 5–6. Viner, J. 1953. Internal trade and economic development. Oxford, Clarendon Press. Williams, Steven and Sue Williams 1994. Being in the middle by being at the edge: Quaker experience of non-official political mediation. London, Quaker Peace & Service. In response to a recent newspaper article on the background of apartheid, a historian, renowned for his research on white Afrikaans-speaking South Africans and apartheid, stated the following: ‘The initial idea of apartheid did not come from academics in the social sciences or humanities, but from people in the churches, the missionary field and the theological faculties’ (Giliomee 2013:12, my translation). For instance, Nehemiah 13:1, 3, 23, 25, 30–31. About South Africa’s religio-cultural and socio-political background a brief overview is given in an attachment (‘South Africa – ancient, old, new’) to an ACCORD publication, Views and visions of coexistence in South Africa (ACCORD 2008:103–109). For a whole volume written from a contemporary perspective, see Giliomee and Mbenga 2007. His initials, ‘H.W.’, pronounced in Afrikaans almost as the name ‘Harvey’ is pronounced in English, were generally used as his first name, and I do the same in this paper. ‘Boer’, the Afrikaans for ‘farmer’, was a term which the mostly rural Afrikaans-speaking community proudly claimed ownership of. ‘Brit’ was a term they used fairly neutrally for a British person. ‘Quakers’ ‘was originally a nickname applied to the group because of the way they shook during worship’ – in which they focused on ‘the centrality of direct inward encounter with God’ (Dandelion 2008:2). Although they rather call themselves ‘the Religious Society of Friends’, they readily go along with the use of the nickname. H.W. was elected as the first President of SAACI (Centre for Intergroup Studies 1989:18). When Alice asked the cat, ‘Would you tell me, please, which way I ought to go from here?’ the cat replied: ‘That depends a good deal on where you want to get to’ (Carroll 1984:81). Initially, during the time of the anti-apartheid struggle, H.W. emphasised: ‘The term “conflict resolution” does not apply to fundamental social problems in South Africa. Underlying causes of conflict cannot be completely removed’ (Van der Merwe 1989b:116). Later, however, in a chapter entitled ‘Conflict resolution: South African beginnings’, he wrote the following: ‘The concept of conflict resolution as a synthesis of conciliation and coercion provided the theoretical and academic insight that guided the Centre for Intergroup Studies in the development of a comprehensive hands-on “constructive programme” which entailed research, training and practical intervention, both impartial and partisan’ (Van der Merwe 2000:98). At separate public functions in Cape Town, Port Elizabeth, Durban and Soweto (Van der Merwe 1989:title page). ‘Quakers, internationally, have traditionally sided with the underdog and in South Africa interventions by British and South African Quakers have consistently been inspired by the plight of the underdog. During the Anglo-Boer War Quakers sympathized with the Boers and at present they assist blacks’ (Van der Merwe 1989b:93). H.W.’s many writings (11 books and almost 150 monographs, papers and articles) were written ‘alone or usually in characteristic partnership’ (Centre for Intergroup Studies 1989:19). A draft of this paper was presented at the African Mediation Seminar, hosted by the Independent Mediation Service of South Africa (IMSSA) and CCR, and held in Johannesburg on 3–5 November 1998. The full text of the occasional paper was presented as concept paper at the Seminar on International mediation in African civil wars, hosted by CCR in Cape Town on 29–31 July 2002. In the township of a small rural town to which she was banished by the apartheid government (Van der Merwe 2000:111). While still in prison, six years before he was released, Mandela told H.W. that he had read about his bringing political opponents together, and had heard him talking on Radio Africa – for all of which he congratulated H.W. warmly (Van der Merwe 2000:120). Another case of initials serving as first name. With Dogmatics and Ethics as teaching responsibilities. In this year, 2013, a journalist’s interview with 87 year-old Johan Degenaar appeared in the Cape Town Afrikaans newspaper, Die Burger, under the title (translated) ‘The philosopher and the miracle of life’. He told the journalist: ‘I find it such a fascinating thing to live, to explore the senses, and to explore the meaning of words! … I came to Stellenbosch to study theology, but then I met Socrates. That was a pivotal point, those words of Socrates: “An unexamined life is not worth living”‘ (Brümmer 2013:[By]3, my translation). The significant concluding sentence in a Profile of H.W. in the 21st Anniversary Review of CIS is: ‘As he has said, “the two goals of peace and justice are complementary and the one cannot be achieved without the other”‘ (Centre for Intergroup Studies 1989:19). See H.W.’s outline and discussion of approaches to conflict (Van der Merwe 1989b:62–65), in which joint problem solving is compared with competing, smoothing, avoiding and compromising, and is recommended as the one approach that is both duly assertive and duly cooperative. The ‘Student Workshop’, at which about thirty students and academics met in Cape Town (18–23 January 1971) and where eleven papers were presented and discussed, was a pioneering and groundbreaking event. It brought together Black Consciousness Movement leader Steve Biko and white English- and Afrikaans-speaking students. These students were from the three separate student organisations, respectively: the South African Student Organisation (SASO), the National Union of South African Students (NUSAS), and the Afrikaanse Studentebond (ASB) (Van der Merwe 1989b:67–68). About the concluding of this workshop and the way forward, H.W. wrote the following: ‘Adam Small, a leading coloured intellectual and philosopher at the University of the Western Cape, concluded the workshop with a plea for cultural understanding, which promised a “cheerful future”. Practising it would not be easy, but worthwhile. His views reflected mine, and those of the organisers of this workshop’ (Van der Merwe 1989b:69). See Nathan 1999, where examples (and cartoons) are given of tough diplomacy and other attempts to rush the process, and where two of the six strategic principles discussed are: ‘Conflict cannot be resolved quickly and easily’ (Nathan 1999:8–10) and ‘Mediators should not resort to punitive action’ (Nathan 1999:13–14). Elsewhere H.W. refers to the view of Adam Curle, a renowned Quaker scholar and mediator, ‘that it is through “concerned impartiality” that mediators are able to remain on good terms with both sides’ (Van der Merwe 2000:205). See the quotation from The Community Board Program 1986:8–9 in the Foreword of the previous issue of this journal (African Journal on Conflict Resolution, vol 13, no 2, 2013).